To me, this is a welcomed surprise in the good ol’ lack-luster Summer Blockbuster season. Despite its annoying title, Rise of the Planet of the Apes (I count ‘of the’ twice) is an incredibly entertaining film. I had little to expect for this one due to the embarrassing trailers, the no-name director and writer, and the fact that no one needs a another movie in this series; especially since the last entry in the series was Tim Burton’s 2001 abomination. I am a big fan of the 1968 original, and I find that even though these are stylistically very different films, they are both on par with quality and entertainment. 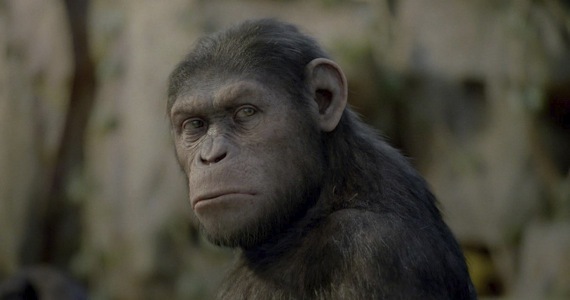 This 2011 movie acts as a prequel to the original, where we experience how the Apes in question Rise up and take over our Planet. Albeit, they might be planning for another sequel or 2 in order to fully complete said ‘Rising’. I also couldn’t help but think about Animal Farm since I am currently reading that book. This film makes sure to shed the camp-factor that is found in the original and tries to remain grounded in some sort of reality. Despite the silly concept, Apes 2011 has numerous well crafted moments where the director effectively makes us feel thrilled, uneasy, excited and emotionally involved. However the majority of acclaim should be given to the digital effects and Andy Serkis. If you don’t know who Serkis is, he is the master who played Gollum (Lord of the Rings) and Kong (King Kong) using the motion-capture suit technology. Here, he plays another creature, Caesar, the ape who leads the uprising. Since he is a methodical actor, he delivers an exceptional performance here (along with the incredible effects used to digitize Caesar). Even though this is the 2nd ape he has played, Caesar is much different from Kong, playing less on the emotional side, and focussing on a more exaggerated approach. Grunting and crawling his way through the film, he upstages anything else we see and decidedly becomes our main character. The director puts the primates at the forefront of the film, and this was a wise decision (essentially flipping the point of view for the entire series). However, he winds up making most of the humans into negligible characters that serve little use (Brain Cox and Freida Pinto), or are over acting parodies (John Lithgow and Tom Felton). But who cares, because we are here to see the monkeys. There are other problems with plot holes and ridiculous time lapses, but since we are so devoutly following the life of Caesar, we don’t care. The old adage ‘less is more’ is always a great idea in film storytelling. Minimalism can be very effective when applied to dialogue; we listen more, when less is said. The best parts of the best movies are often lacking in dialogue and focus on the images we are presented with (think Wall-e, 2001, Tree of Life, No Country for Old Men, There Will Be Blood). Thankfully, since much of the film focuses on Caesar, we spend a lot of time just observing this speechless ape interact and it certainly is enthralling. But one can also argue that ‘more is better’, and the final action sequence that takes place on the Golden Gate Bridge will certainly deliver on the awesome factor. Summary: Rise of the Planet of the Apes takes its time to develop a well crafted ape character that will impress on both a technical and emotional level. But it is the emotional grounding that makes such a preposterous movie work. Many of the human characters fall flat, but they aren’t the main focus anyways. There are surely sequels to follow, that will finish the ‘rising’ and I can’t wait to see what Andy Serkis will do next. This is movie #199 of the 1592 films I’ve seen. Nice review, Peter. I, too, have been hesitant about seeing this movie due to the weak trailers and my general lack of interest in the series, but I keep hearing nothing but good things about it. I think I'll try to catch it this weekend. "Way better than it has any right being" LOL. That's pretty good right there. It IS all about Ceasar though. The humans are the worst for of window dressing. New to your blog - tell me - #199 of 1592, does that mean you've ordered every film you've ever seen, and update it every time you see something new? It is there that I have systematically, over time, ranked all of the films I have seen into a neatly organized list. It's free. Granted, for me, new movies can be skewered a bit higher, but over time, it all works out. I'm looking forward to the film this weekend. Nice site you have here, enjoy the LAMB. Hope to see you around my site sometime. I wasn’t actually expecting to be as moved as I did from this material but Serkis just really channeled the inner ape within him, and nails this perfect motion-capture performance as Caesar. Good Review! Our reviews actually aren't that far apart! Peter, yeah man, I've used Flickchart. I found it excellent at first. I ranked like 7,049 films (reportedly). I quit because a) I'm sure you get to a point too where you can spend 20 minute stretches and get no movement to your chart at all b) There's no easy way to change your rankings. So in other words, lets say I want to reorder my top ten by flopping movies 8 and 9. I would have to click through my top twenty zillions of times before that combination came up. They should let you combine the choosing game they have now (which DOES work very well) with a moveable list. Then they would be a force to be reckonned with. I was plain shocked by how much I enjoyed this film. Not at all the stupid action film the trailers wanted you to think it was (although some suspension of disbelief is definitely required). I especially agree with what you said about the film making great use with little dialogue. For me some of the best parts of the film were watching the apes interact with each other.